I've been watching that. There will be a Jersey Barrier between the NB and SB lanes of I-540. I'll be up that way again in a few days so I'll get a better look. Three other Fort Smith-area interchanges for the new northsouth interstate are nearly finished, according to Shipman ... Complete or nearly complete are interchanges at Arkansas 22 (Rogers Avenue), Roberts Boulevard and Massard Road. It looks like they have a good chance of meeting that 2014 opening target. The Rye Hill-Barling stretch of I-49 will be pretty much worthless when it is first opened. It will be useful for Barling residents going south on 71, but I doubt it gets 2000 cars a day until it is extended. Or a truck bypass. Should we start kicking around numbers (like Spur 71) ? Probably a second Highway 549. I'd have to disagree, though another x49 is possible. Take a closer look at the schematic posted above. US71B????? I thought it was AR255. Looks like it's co-signed as 71B/255.... an apparent mistake. I hope AHTD isn't dumb enough to do a re-route on 71B. 59 would make a lot of sense as a temporary number. 49 is the only number that makes sense. Call it AR 49, I don't care. Just don't give it a number that is planned to become obsolete in a few years. 471 was meant to be permanent. It was the idiot business owners along the road that caused it to be changed back. To be honest, 71B is the better number for the road. But it should revert to 71 and the spur between 71 and 540 in south Fayetteville could become 471. About 20 years ago, I think AHTD still called it 471S, but it's now invisible 71S. 71S? It's mainline US 71. Once there was a 71S sign on 540 south but it was an error and was replaced. I though I saw on a map the section of the old 71 Bypass from 540 to College Ave was 71S (though not posted)? Arkansas has a history of this. It'll either be SH 549 or 449. - Visited the UnderCliff bar and grill in Tipton Ford, Missouri (just south of Joplin, where you can hear the traffic on the near-future I-49 bridge from the restaurant's front deck as well as watch Kansas City Southern trains on that railroad's original Kansas City to Lake Charles/Beaumont-Port Arthur mainline. What's interesting is that the restaurant is on old U.S. 71. WOW. It's only a paved country road with no shoulders. What a difference a few decades make. Other businessmen/bikers were at the UnderCliff, bound for BBB in Fayetteville. - Hadn't driven on I-44 southwest from Joplin to the Oklahoma line in a while. WOW #2 (though I've seen the east side development). The trucking companies and the big truck stops in nice buildings popping up at this future I-44/I-49 junction makes me wonder what's going to happen when I-49 is finally linked between Pineville, MO and NWA (and then on to Fort Smith) and someday (when I'm dead) to Texarkana when Fort Smith genuinely becomes a two-interstate junction city and Shreveport (and possibly Texarkana) becomes a three-junction city. The Low bid for HWY. 71 , HWY. 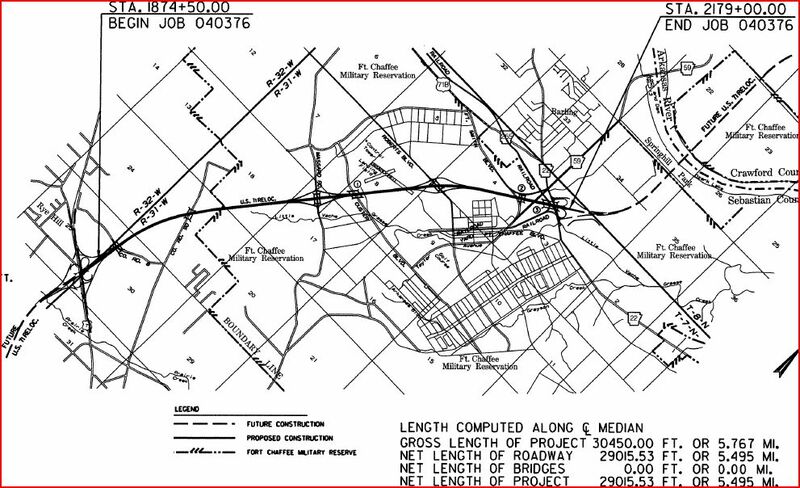 22 (base and surface) at Fort Chaffee crossing was 22,649,692.08 from APAC- Tennessee, Inc.
Plans are in the works to build a major interstate right through the heart of the River Valley. The state Highway Commission chose bids this week for a portion of road that is expected to become part of Interstate 49. Construction should take about two years. 43,000 cars a day before it connects to I-540/Future 49 north at Alma? All the grading and structures are complete from AR 22 at Barling to just past Rye Hill. Rye Hill to US 71, crossing Howard Hill Rd, just started a couple months ago and is projected to finish around 2014. I wonder if AHTD & APAC will wait until that's done before starting paving. KFSM makes it sound like construction has just begun even though it's been on-going for 3+ years. Also, 49 won't run to Canada, only to Kansas City. ... the outcome of a vote last week in Arkansas, when residents imposed a half-cent sales tax to raise money for transportation projects around the state. Among those projects that will be funded with the new tax revenue are the first two lanes of the Bella Vista bypass. Missouri officials have committed to matching what Arkansas does, meaning the long-awaited project is on the road to becoming a reality. “The good news is that the Bella Vista bypass will be one of the earliest projects in this program,” Randy Ort, spokesperson for the Arkansas State Highway and Transportation Department. The current southernmost Missouri (as of 12/12/12) exit to I-49 at Pineville, waiting for the bag to come off...the blue signs are all up the current U.S. 71 now from this point at the turnoffs. Pineville is the last zip code in Missouri prior to crossing the Arkansas line at Bella Vista. 1/2 mile south of this is the four-lane extended signage structure, northbound lane rock cut and (currently blocked-off) southbound exit ramp to the future BV bypass, all of which were in place around 2005/2006 and ready to be built had the Arkansas legislature been ready to fund their side then. is it just me or does that shield lack the state name? Missouri is usually quite fastidious about this.